24/7 safe, reliable, affordable, quick crane hire Perth Western Australia, for light and heavy load lifting jobs. For cranes lifting heavy weights consider hiring 2 cranes at the same time as in this Fremantle crane hire lift job photo below. The above photo is of Ashburton Crane Hire in Fremantle WA lifting prefabricated minerals processing plant equipment from a docked ship on to trucks. Because we have our own crane transporter and quick to action crane administration staff in our Perth office, we can provide a quick crane service Western Australia wide. A Western Australian lithium company hired two cranes to lift heavy engineering ship cargo from a ship docked at the Fremantle wharf. 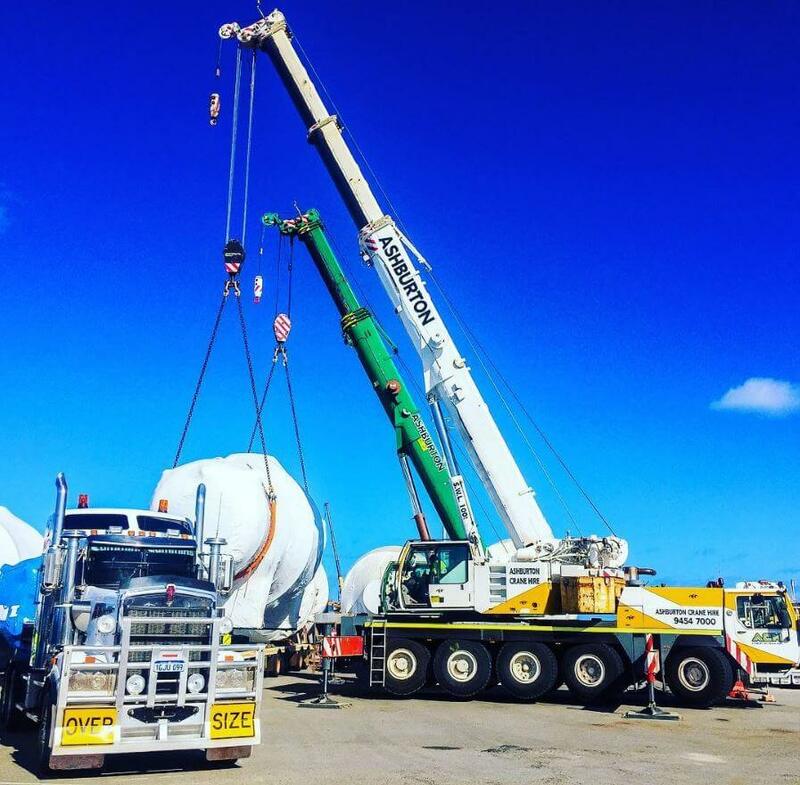 The synchronised cranes lifted the heavy loads while low loading trucks moved in position before transporting loads to a new lithium plant project in the heavy industrial zone at Kwinana WA, near Fremantle. Our hired cranes followed the trucks from the wharf to the Kwinana industrial zone. Our hire cranes unloaded and lifted into position the heavy lithium mineral processing plant equipment. For quick crane hire at Rous Head near North Fremantle's container loading wharf, contact our crane hire manager for quick crane hire company services. 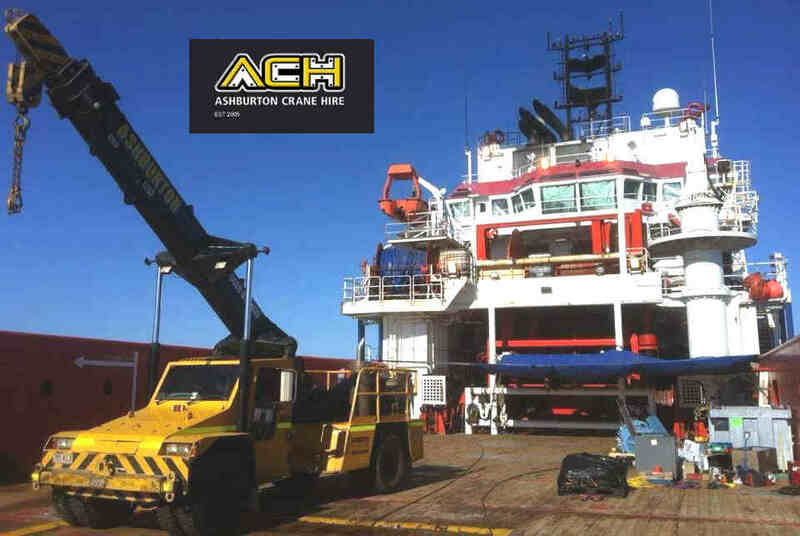 Below is a photo of one of Ashburton Crane Hire's Franna cranes quickly loaded onto a ship at Perth's Fremantle harbour for a marine lift job off the Indian Ocean coast of North West, Western Australia. 24/7 quick crane hire Kwinana and crane hire near Kwinana at Kwinana Beach for quick crane hire services for petrochemical industries of WA. 27/7 quick crane hire Garden Island naval base for lifting Australian navy equipment. Quick crane hire near the Australian Marine Complex AMC. Quick crane services for the Western Australian ship building industry near Fremantle WA. For kwick crane hire Perth, Fremantle crane hire etc services contact us now.